Your username will be used in the url and is associated with your Royal Roads academic account. Your username (which is usually your first initial and your last name, but may contain a number in front of your last name, for example: jsmith or j1smith), and RRU email address will be linked to your WebSpace site. Login page url - https://webspace.royalroads.ca/jsmith/wp-login.php, (substitute your username for jsmith into your favorite browser). For example, using jsmith as the username, replace the above "yourRRUusername" with your username. Although managed by Royal Roads, the WebSpace service is hosted by a FIPPA compliant Canadian web hosting company so we can take advantage of the top tier data centers and high infrastructure reliability. When you login to your hosted WebSpace, Royal Roads servers sync your name and email address. The first time you login, you will be asked to consent to this data sync. 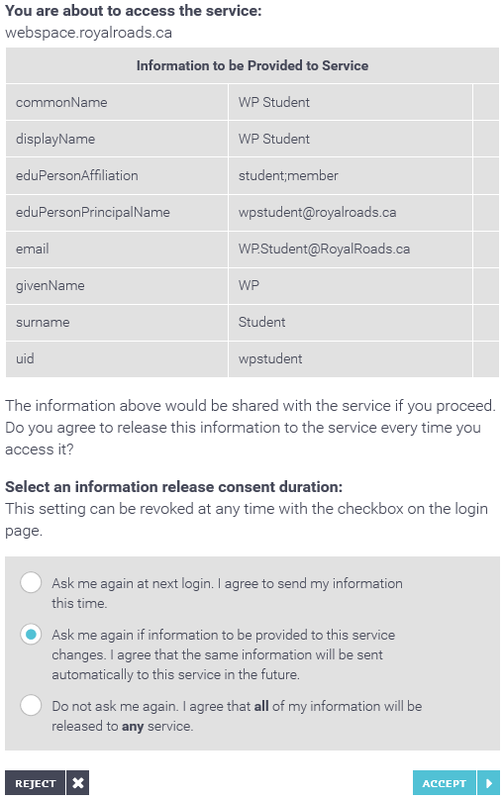 If you select the “Clear prior granting of permission for release of your information to this service” when you login successive times, you would be again asked for consent for the data sync otherwise you are only asked the first time you login. Once you click ACCEPT, you are logged in! If you don't see your site, look in the top left under My Sites for your site and dashboard. 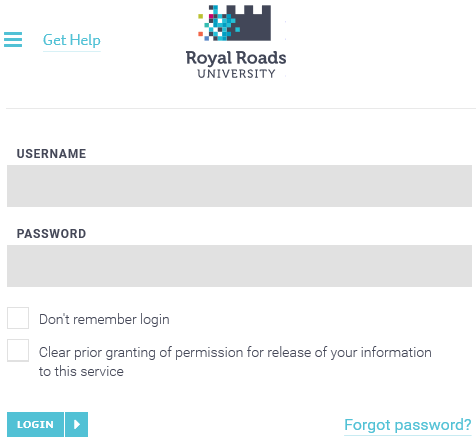 log in with your Royal Roads username and password. then click the Log In link in the top right area of your browser window. Note: After logging in, if you don't see your WebSpace site and only see the root site, a site may not have been created yet for you. If your course is using WebSpace, contact your instructor or submit a support ticket online. 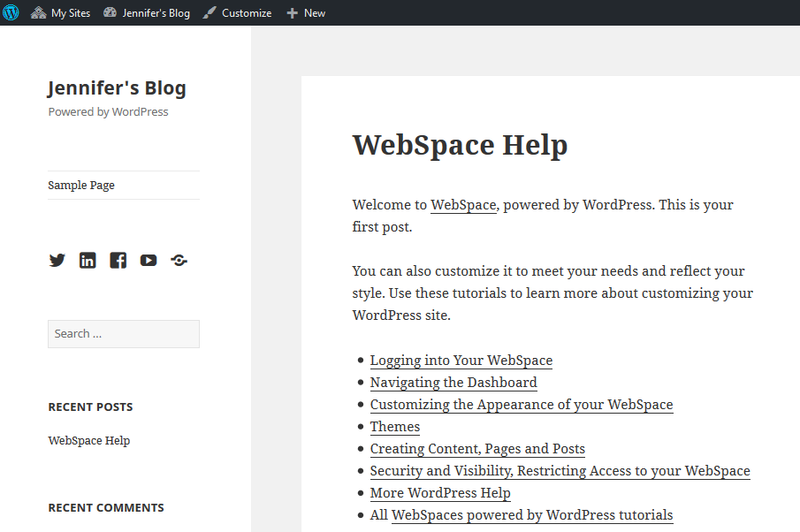 Now it is time to get to know the WordPress dashboard so you can start customizing your site and creating content.